Presteigne/Llanandras TownPresteigne, (Llanandras in Welsh), was once the county town of Radnorshire and nestles at the heart of the Mid Wales Marches on the border of Wales and England. Surrounded by devastatingly beautiful, unspoilt countryside, this thriving border town has many unique qualities that make it both a perfect destination and a base from which to explore. 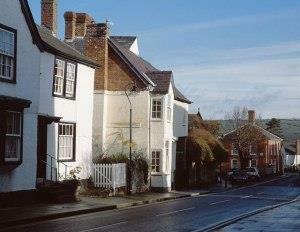 Presteigne High Street has a good range of individual shops, restaurants, pubs, hotels and services. Good accommodation is plentiful, both in the town and the surrounding area, and whether your choice is self-catering or serviced accommodation, high quality local and organic produce is available in both shops and restaurants. Presteigne began life as a small settlement clutched around St Andrews Church. It was registered in the Domesday Book under the Humet Manor. Despite some prosperity in the next hundred or so years, the plague and the Glyndwr rebellion consigned the inhabitants of Presteigne to hardship. The Tudor period saw a resurgence in economic activity in the town, with the cloth trade providing the majority of townsfolk with their income. The early modern period brought stability to the town which grew to become the administrative centre of Radnorshire. Presteigne, (Llanandras in Welsh), was once the county town of Radnorshire and nestles at the heart of the Mid Wales Marches on the border of Wales and England. Surrounded by devastatingly beautiful, unspoilt countryside, this thriving border town has many unique qualities that make it both a perfect destination and a base from which to explore. The Judge's Lodgings Visitor Centre, located in the town centre is well worth a visit and annual events include the Presteigne Music Festival.